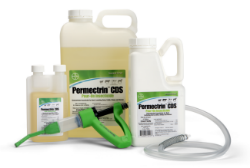 A synergized formula for direct use on beef cattle, dairy cattle (including lactating), sheep, lambs, horses and foals for the control of lice, ticks, horn flies and face flies among other pests listed on the label. Ready-to-use spray is a concentrated formula that is convenient to apply. It can be diluted for back rubber applications on cattle. It can be used as a premise spray. Horses & Foals: ¼ to 1/5 ounce per head.